Growing up, it was customary to have avocados with your meal, for optimal enjoyment . ; just like it is customary to “butter up” everything, here inAmerica. The only difference is the fat content in butter is outrageous. A 3.5-ounce of butter has an enormous 81 grams of fat compared to 14 grams in the same serving of avocado. 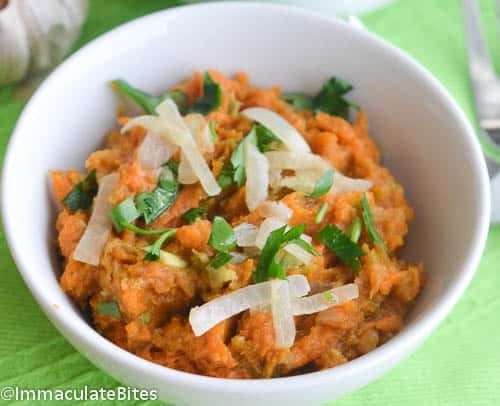 Including avocado in this sweet potato recipe will help reduce saturated fat content from your meals and replace them with healthy fats. You know the days that you are trying to minimize your calorie intake. You do have those days, don’t you? I like to indulge once in a while, by including butter in savory foods. But most often I would opt for more food. 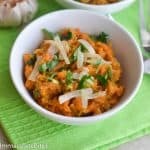 Although roasted garlic is very mellow as compared to raw garlic; it adds a lot of depth and flavor in these mashed potatoes without overshadowing the other ingredients. It also has its health benefits and can be added to most meal or you it can serve it, as an appetizer or use as rub on toasted bread. 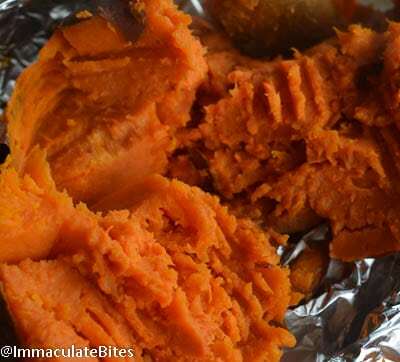 This is not your typical sweet potatoes. 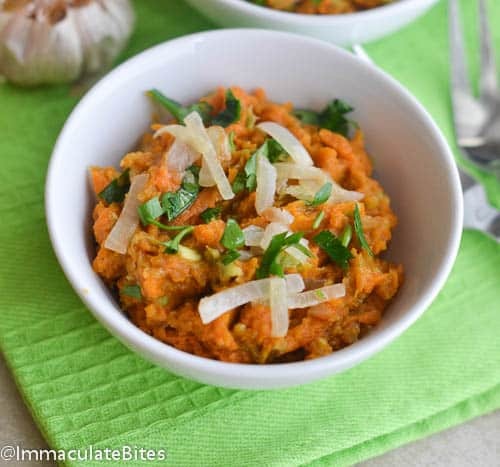 This one is intriquing – it combines avocado, roasted garlic, sweet potatoes and topped with sweet onions , parsley. Simple, satisfying and makes for an extremely tasty meal, very suitable to your time-crunch food prep needs. 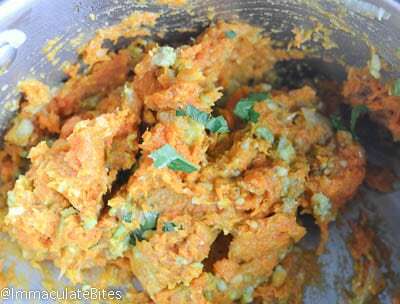 Try this mashed sweet potato and avocado recipe , you will not regret it. Preheat the oven to 400 degrees. 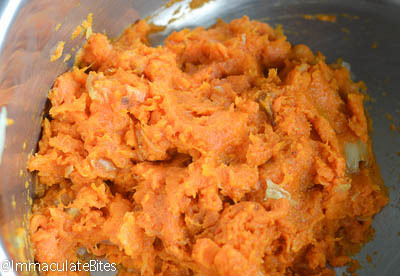 Clean and dry the sweet potatoes, poke holes into the sweet potatoes, place in the microwave and cook for about 4 minutes. 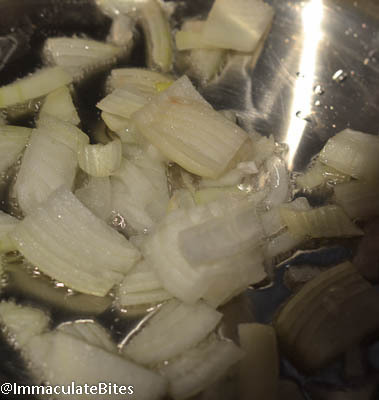 Cut the top 1/4" to 1/2" off of a whole head of garlic, so that each individual clove should be visible. Make sure every garlic clove is exposed. 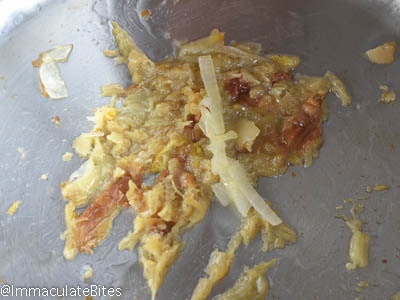 Place the head of garlic on foil paper .Drizzle the top of the garlic with a bit of oil, about 1 teaspoon. Wrap it up and place it the oven to roast together with the potatoes .Roast sweet potatoes for about 20 minutes or until they are cooked through. 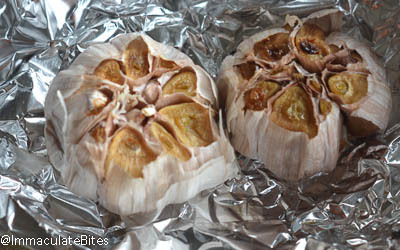 Roast garlic for about 30 minutes; it should be soft, fragrant, and golden. 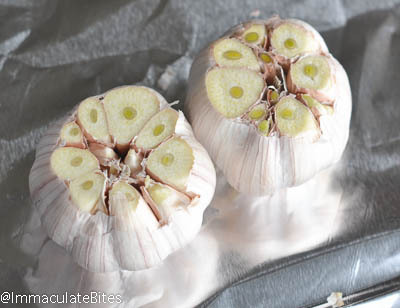 Let the garlic cool then squeeze individual cloves out of the skin. Mash the sweet potatoes and roasted garlic, with a wooden spoon season with salt and pepper .Set aside. Peel avocado, add lemon juice, mash together. Combine with mashed potatoes. Serve immediately topped with onions and chopped parsley. And WAY better than I imagined. Seriously flavorful! Any suggestions if one has an aversion to microwaves? Will this last for leftovers? I’m thinking of meal prepping it on a Sunday for dinner during the week, but I know avocados don’t last and turn brown. Thoughts? No it would not last because of the avocados.Just like you mention, they do turn brown. This sounds delicious. One little question: the sweet potato ingredient is written as ‘1 sweet potatoes’. Is the missing word ‘pound’? I’m sure you’re using more than one potato, especially with 2 full heads of garlic. Barb, thanks for pointing that out. I have updated the recipe. How much in a serving ? How many calories in a serving ? Hi kage ! recipe has been updated with servings and calories. This was great! Thanks for the recipe! Honestly? I used just 1 head of garlic, 2 seemed a bit much for me, but I LOVED it!! Will be making this again for sure! Thank you!! I just found your blog and I’m so thrilled to have. 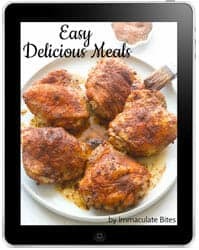 I love that you are presenting something different from what I usually see on food blogs, and I’m really excited to try a number of the recipes. 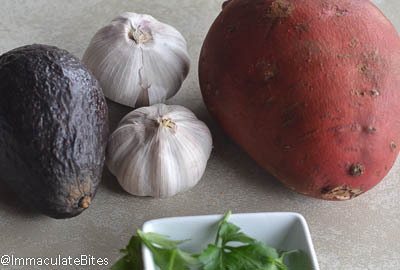 I was on a kick last year where I was eating a lot of sweet potatoes, avocados, and fresh garlic because all three have great health benefits. But, I never thought to combine them all. This looks like a really interesting and delicious combination which I will try this weekend! I’ll try to remember to report back after I try it. Thanks for reporting back kendall, glad you enjoyed it just as much as I do! It really smells and taste good. Thanks for stopping by!